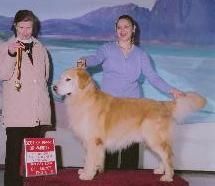 Pete is a Silver Ehrenschampionat in the UCICB International system - with several BEST IN SHOWS to his credit. At 10 years old (Jan '08) Pete is now "retired" and is enjoying being the top dog and couch potato extraordinare. HAPPY 9th BIRTHDAY PETE! Jan 23, 2007. We gave him his McDonald Cheesburger, but got the photo too late.. Funny boy! Is there another hamburger for me????? (No Pete, you have to share with Angel, it's HER birthday TOO! 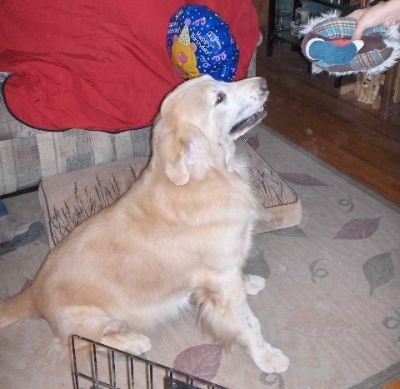 See Angel's birthday pictures by clicking HERE). Oh, no more tasty treats, guess I'll take the woobie! Pete and Heather-Pete's very first visit to the beach! Ventura CA, July 2005. See more pictues below of our Ventura weekend. 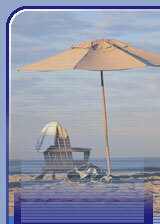 More beach pictures at the end of this page. To view Pete's pedigree, CLICK HERE. A BEST IN SHOW WIN! Pete and his 2 sons, Sherman on the right (at 8 months old) and Ditto on the right, at 2 yrs old. 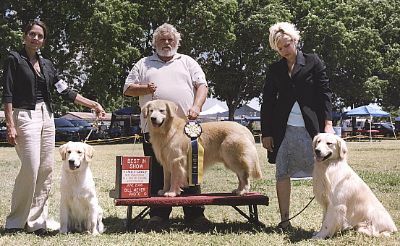 Pete winning BEST IN SHOW VETERAN in June 2006. 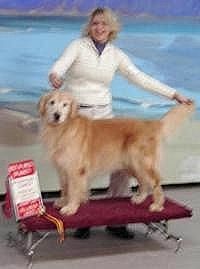 (I guess we can say Ronnie was a Best In Show Veteran too.... He's a Veteran AND he's old! SHHHH, don't tell him I said that!!!!). Here's Pete at the specialty in Santa Clara, being shown by Ron. This was Ron's first time in the show ring, too! Pete has an excellent topline and smooth movement. Good angulation and a strong, well-muscled rear and a dense double coat. Pete has a correct scissor bite, good ear carriage and a WONDERFUL temperament and personality! He stands 24 inches at the shoulder and weighs 81 pounds - ALL MUSCLE! JUST LOOK AT HIM NOW! Pete. posing for his first place Veteran Dog picture with our daughter Heather, who handled him. July 2005 in Ventura. CA. Judge Dana Cline. 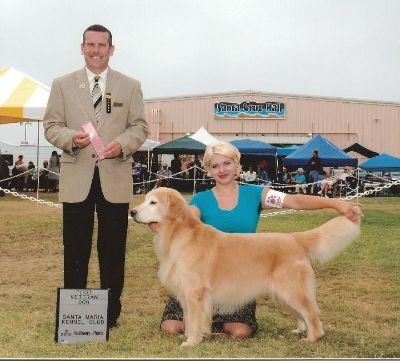 Moving around the ring, Ventura CA, July 2005, Pete and Heather in the Veteran's Class (first place). Pete won first all 3 days at the Ventura, CA shows but we only got photos of day 1 & 2. GOOD JOB PETE & HEATHER! 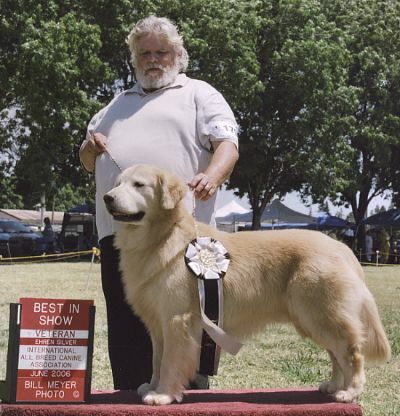 MADERA, CA June 2006... Pete won BEST IN SHOW VETERAN TWICE, and reserve Best In Show Veteran TWICE. 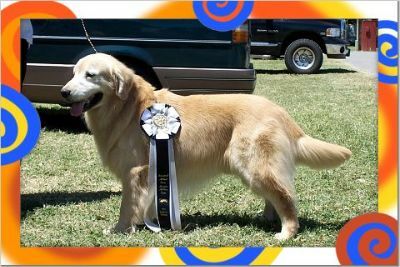 With Pete's help, we won the BEST IN SHOW BREEDER'S GROUP with his 2 sons, Ditto, and Sherman. A picture will ba added as soon as we receive it! 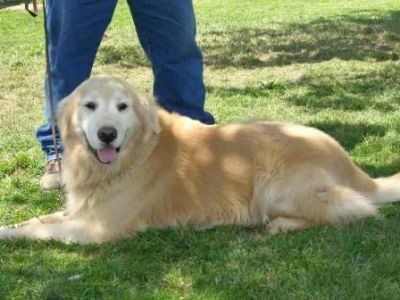 My Service/Assistance Dog, here is Pete at the Fresno Fair, Oct. 2005. I am taking the photo. I told Pete to lie on the straw bale. He almost didn't get his whole bottom on it! Always the helpful Assistance Dog, Pete is answering the cell phone. "CAN YOU HEAR ME NOW?" Pete is in the upper left of this picture. His Great Grandma is on the upper right. 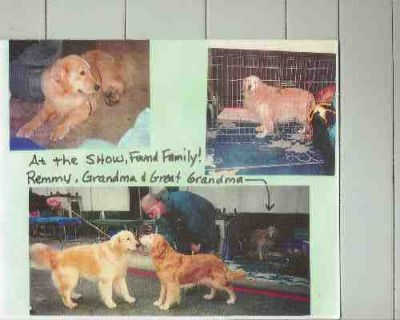 The bottom picture is Pete, meeting his Grandma.They were both at our first Golden Specialty. It was so nice of Ken Matthews to introduce himself and give us Golden newbies a few pointers! 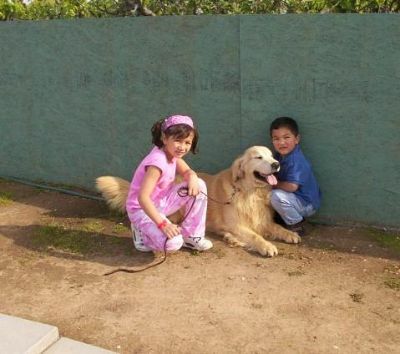 My niece Tracy, and nephew Andrew show what a well behaved boy Pete is. They are in the training ring at Promise Kennels. 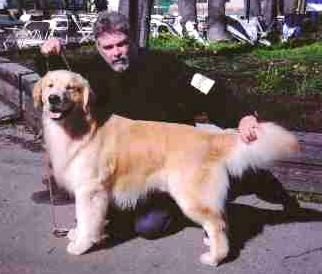 This is Pete at his first IABCA show, in Santa Rosa, Jan 2004 at the mature age of 6. In all 3 shows he won FIRST in his class and BEST OF BREED. Our daughter Heather is showing him for us - and she did a great job for being new to dog handling! She's no stranger to a show ring though. She bred and showed champion LaMancha Dairy Goats while in 4H. Pete and Heather at his 3rd International show. AND, as a REMINDER, I am NOT a photographer! 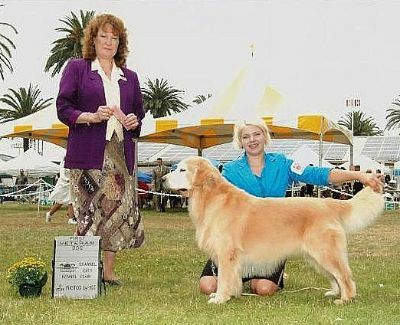 Here's Pete at 6 1/2 yrs old, winning his National Championship (CAC) at the IABCA show in Newport Beach, CA in April, 2004. 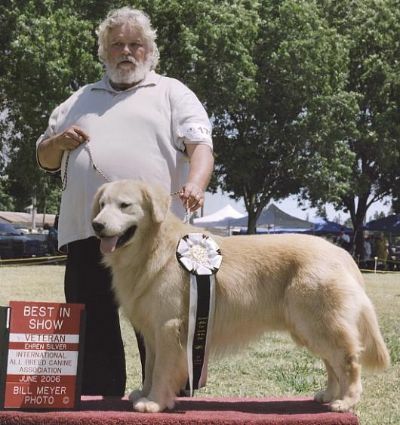 In spite of being in the midst of blowing (losing) his coat for the Summer, Pete won FIRST in his class in 2 out of 3 shows, Won BEST OF BREED VETERAN in 2 out of 3 shows, and won TWO GROUP FIRSTs in the Veteran's class. Ron did a great job of handling Pete - and the other 2 Goldens (Angel and her dad, Ragoon), plus our Springer Keeli. 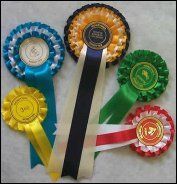 At the 3rd show all 3 Goldens won their classes and had to go into the BEST OF BREED together! We had to enlist the help of another show participant to give us a hand. Unfortunately, Judy fell in the ring (dumb MS!) and really messed up the flow of everyone. What a day! This is Pete during his Therapy Dog evaluation with a Therapy Dog International evaluator. Stu Galka. Pete passed with flying colors! We knew he would, because he is Judy's Assistance (service) dog. 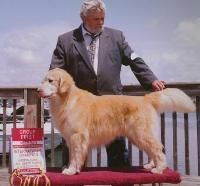 If you want to know more information on Therapy Dogs, click on this link: http://www.tdi-dog.org/ For more information on Assistance/Service Dogs, go to: http://www.iaadp.org/ Ron and Pete were just certified together as a team. This is great, because once they have gone to area hospitals and put in enough hours, Ron will be able to become a Therapy Dog Evaluator for TDI. SMILE!! This is the picture we used for Pete's Certified Therapy Dog Badge. Smilin' Pete, always a good boy! What a beautiful pair! Heather and Pete (watching the surfer dudes!). CALIFORNIA DREAMIN"... Moments after this picture was taken, Pete decided he wanted a spa treatment and laid down in the surf... HE LOVES WATER!